I understand what a challenge it is to find Orton-Gillingham activities suitable for your students. Your Orton-Gillingham lesson plan and you will be ready to go with this extensive bundle of multisensory reading and spelling activities. 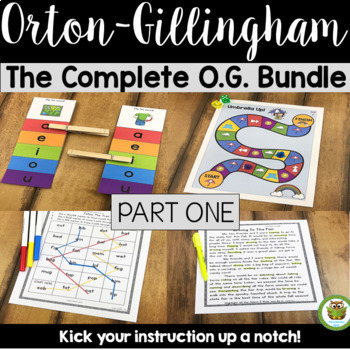 Write your Orton-Gillingham lesson plan and you will be ready to go with this extensive bundle of multisensory activities to support your instruction. The multisensory activities provided are compatible with the Orton-Gillingham lesson you follow. If you are an Orton-Gillingham tutor or teacher, this resource will be invaluable for years to come. The Complete O.G. PART ONE is a BUNDLE that I have created for use with the Orton-Gillingham approach for each Orton-Gillingham lesson you follow. I am an IDA Certified Dyslexia Practitioner and Orton-Gillingham instructor through an accredited IMSLEC training program and use the Orton-Gillingham method in my teaching. I am also an Associate member of AOGPE. 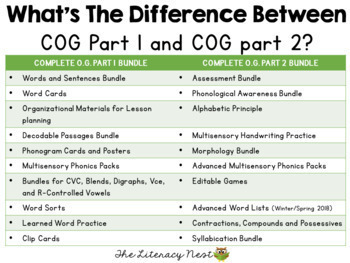 After completing a year long, intensive training with a 100 hour supervised practicum with trainers using the Mass General Hospital Orton-Gillingham curriculum, I made the decision to help fellow OG instructors and other reading interventionists by creating these resources. Wilson trained specialists will benefit from this bundle as well. FOR FURTHER ORTON-GILLINGHAM RESOURCES AND PURCHASING, THE COMPLETE O.G. BUNDLE PART TWO IS A CONTINUATION OF THE PART ONE BUNDLE. 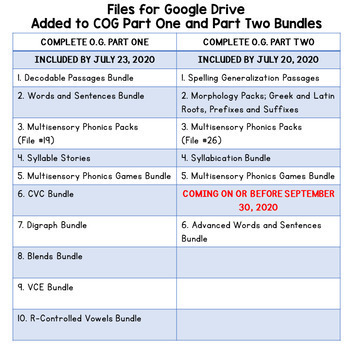 What's the difference between The Complete OG Part 1 Bundle and The Complete OG Part 2 Bundle? 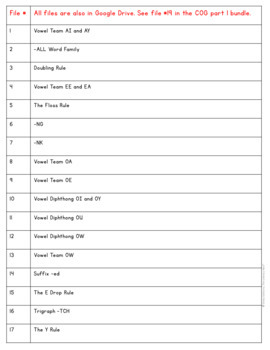 Download this free comparison chart for The Complete OG Part 1 and Part 2 Bundles to see the differences. Note: I do not create lesson plans for purchase because every OG lesson is highly individualized and prescriptive for the child's needs. A lesson I have made for one student may not match a lesson you would need for yours. All of my resources are created to accompany your lesson plans. If you are a new instructor or have used OG methods for many years, this bundle is time saving and cost effective. I've provided ready to use materials for all five levels of Orton-Gillingham instruction. Purchasing all 37 products would normally cost about $300. I'm offering this bundle for $210. As a buyer, you are entitled to free revisions and access to updates anytime I upload them. All you have to do is go into “My Purchases” and download the updated version. I recommend checking in from time to time to see if there are updates made. By purchasing today, you are locked into paying one price, and will receive updates free of any future charges whenever I update it. This product is one large zipped file. It contains 37 products, in zipped files. When you open it, you will first unzip the large bundle. Then, when you are ready to open the files within it, you will need to unzip the other files. If you have any trouble opening them, please contact me. Wondering how to keep this resource organized? Go HERE for a blog post on The Complete OG news and updates. Go HERE for a blog post on organizing The Complete OG. Finally, your feedback is greatly appreciated. I strive to create high quality products for you and your students. If there is a wish or a hope you have for this product, please message me BEFORE rating it. I’m happy to accommodate your requests to the best of my ability. It is a pleasure helping my fellow OG instructors out there. We are helping our readers to succeed in a method that truly works. I thank you for reading this letter and hope you’ll follow me to learn more about OG. Just click the green star next to my name at the top of this store page. You'll hear about my sales, new products and freebies!